Honorable Minister Pohamba Shifeta and U.S. 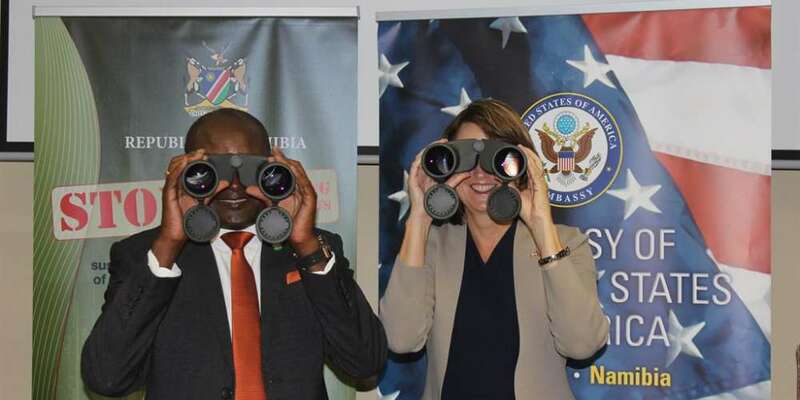 Ambassador Lisa Johnson try out some of the 65 pairs of low light binoculars donated in support of the Ministry of Environment and Tourism’s anti-poaching efforts, 11-Feb-2019. Windhoek – The US Government has retaliated its commitment to assist Namibia’s anti-poaching efforts, as the southern African country struggle to protect its endangered species from poachers. In 2018, Namibia lost 57 rhinos and 26 elephants to poaching, according to latest data by the Ministry of Environment and Tourism. The ministry also said rhinos that fell victim to poaching were mostly in private sanctuaries including private farms, while elephants were poached in the north-eastern regions of Kavango and Zambezi. 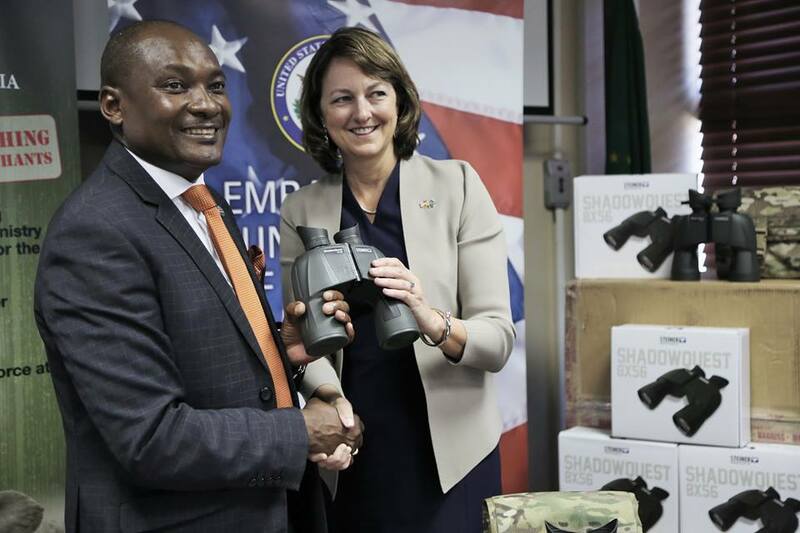 On Monday, February 7, US Ambassador to Namibia Lisa Johnson handed over 65 binoculars to the Ministry of Environment and Tourismto be used in surveillance against poachers. They are part of N$6.8 million ($499,265) worth of equipment that the US Government plan to donate to Namibia over the period of two years. These includes four vehicles, GPS receivers, camping equipment and poaching crime scene investigation equipment and binoculars. 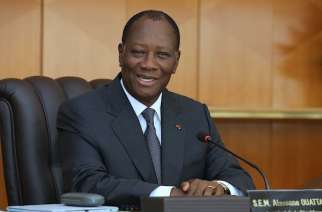 Johnson revealed that the donation is funded through the US Foreign Military Financing Programme for Biodiversity. The U.S. Government is currently funding conservation-related projects in Namibia valued at more than N$276 million ($16,67 million). They comprised community-based work to ensure the value of wildlife for everyone, equipment for anti-poaching efforts, and training courses for those involved in addressing wildlife crime. “The US government investments support Namibia’s own efforts to protect its wildlife. Wildlife crime is a critical threat to economic development,” the US Ambassador said during the handover in Windhoek. 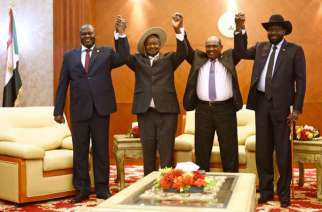 Pictured from left to right, Birgit Kötting, Control Warden for Training, Communication & Logistics; Johnson Ndokosho, Deputy Director: Central Regions, Directorate of Wildlife and National Parks; Colgar Sikopo, Director, Directorate of Wildlife and National Parks; Abraham Nehemia, MET Executive Director; Honorable Pohamba Shifeta, Minister of Environment and Tourism; Ambassador Lisa Johnson, U.S. Ambassador to Namibia; Lieutenant Colonel John Lacy, U.S. Defense Attaché; Jerry Beukes, Security Cooperation Manager for U.S. Defense Attaché Office-Windhoek; Maria Blees, Political/Economic Officer; Manie le Roux, Control Warden, Central Parks, Directorate of Wildlife and National Parks; 11-Feb-2019. 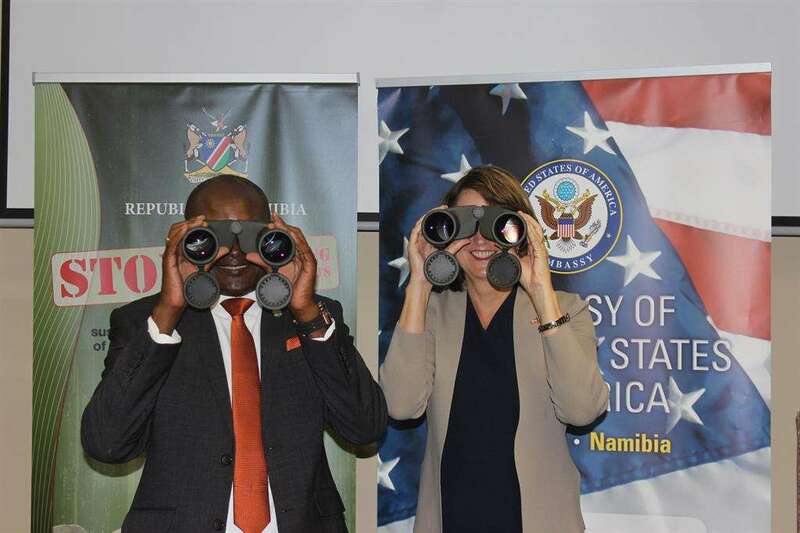 On his part, Environment and Tourism Minister Pohamba Shifeta said the equipment help beef up the anti-poaching efforts, that it will be used to capacitate anti-poaching officials. Shifeta said, “The ministry and other law enforcement agencies will not relent in fighting wildlife crime whenever it happens, hence the ministry has been working hard to recruit the requisite staff for the anti-poaching unit”. Namibia has incurred severe losses of its endangered species mostly rhinos and elephants as poachers continue to hunt gun them down, thanks to the illicit trade of ivory and rhino horns. In September 2018, the Ministry together with the Namibian Defence Force incorporated an anti-poaching dog unit in the fight against wildlife crime. Honorable Minister Pohamba Shifeta accepting the official handover from U.S. 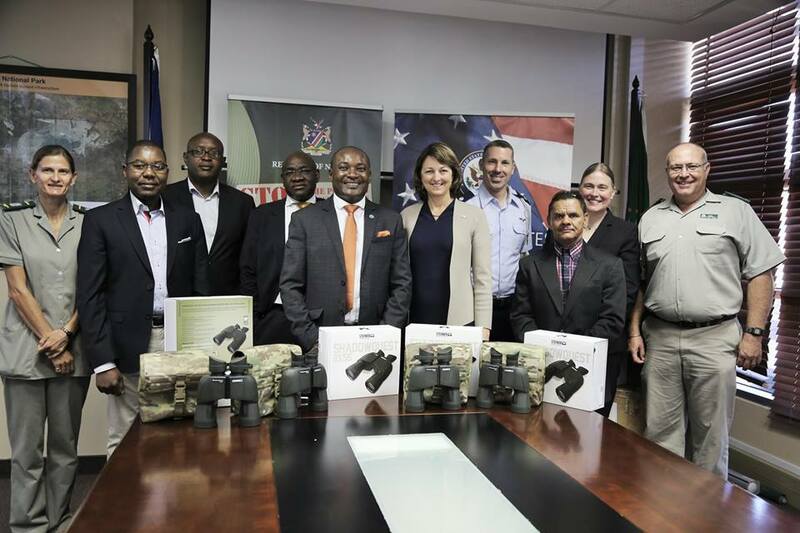 Ambassador Lisa Johnson of 65 pairs of low light binoculars donated in support of the Ministry of Environment and Tourism’s anti-poaching efforts, 11-Feb-2019. The dog unit consist of four German Shepherds were bought in Hollard with assistance from international partners including the United States of America Fish and Wildlife Services. 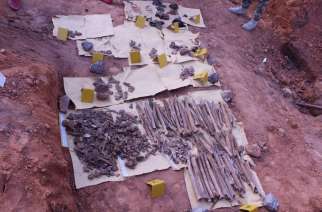 The canines are sniff out illicit wildlife products like elephant tusks (ivory), rhino horn, pangolin scales and game meat, as tracking suspected poachers.